With the flu becoming “widespread” in the Ocean State on January 2, the Rhode Island Department of Health (RIDOH) calls on unvaccinated health care workers in hospitals and other types of healthcare, including nursing facilities, to wear masks when directly treating patients. Examples of direct patient contact include entering a patient’s room, serving food to patients, or participating in group-patient activities. But, RIDOH says that a visit to the emergency department is necessary if these warning signs occur including difficulty in breathing, shortness of breath, having pain or pressure in the chest and having flu-like symptoms that improve but then return with fever and worse cough.” RIDOH suggests that if someone is not sure that they need to go to the emergency department, they should contact their primary care provider who will provide guidance about the next step. Flu viruses spread when an infected person coughs or sneezes near another person., or touches something covered with infected droplets and then touch his or her eyes, mouth, or nose. Symptoms may include having a runny or stuffy nose, body aches, a headache, chills, fatigue, vomiting, or diarrhea. Preventing the flu can be as simple as washing your hands often throughout the day, using warm water and soap. If soap and water are not available, use alcohol-based hand gel. Another simple tip in preventing the flu is to cough or sneezing into your elbow. Flu is spread through coughing or sneezing on other people or into your hands. By cover your coughs you can prevent others from getting sick. Getting a good night’s sleep, being physically active, reducing your stress, drinking plenty of water and eating nutritious foods (don’t use alcohol, caffeine and tobacco) can also help you avoid getting the flu. prevent the flu. Keeping surfaces (especially bedside tables, surfaces in the bathroom, and toys for children) clean by wiping them down with a household disinfectant can reduce the spreading of the flu virus, too. 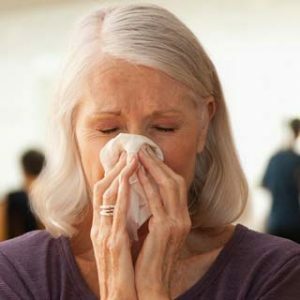 If you have flu-like symptoms (fever plus a cough or fever plus sore throat), stay home from work, school, or child care, or visiting a nursing facility until you have been fever-free (temperature less than 100.4 degrees F/38 degrees C) for 24 hours without the use of fever reducing medications. Finally, consider asking your physician for antiviral medications. Antivirals are prescription medicines used to treat the flu when people are very sick or at high risk of flu-related complications. In order to work, they must be started within 2 days after getting sick.